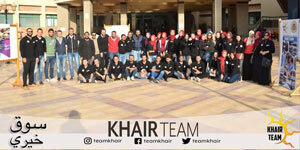 Out of its sense of social responsibility to society at large, the faculty of Engineering in collaboration with Khair Team, opened a charity market. This was held on Tuesday 12/12/2017 at 1.30 p.m. at the entrance foyer of the faculty of Engineering. A plenty of basic food products like vegetables, fruits, rice, sugar, macaroni and clothes were on sale at the charity market. These products were sold less than their value by 50%. The market was open for members of security and Environment Affairs Department.